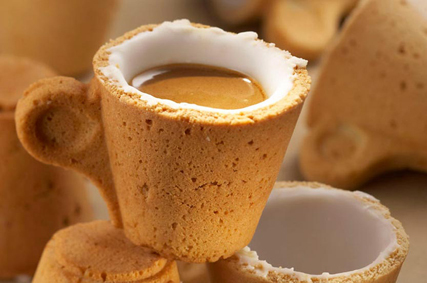 Designer Enrique Luis Sardi has crafted this edible espresso cup for the Italian coffee company Lavazza. With a cookie outside and frosted inside (to make it watertight, and also sweeten the espresso), may seem like a fanciful concept that will never make it out of the laboratory, but it’ll actually be hitting the market in Europe. Given the US’ love of drip coffee and mega-sized espresso drinks, I doubt we’ll see this on our shores anytime soon (really, when’s the last time you saw someone order an espresso at your local Starbucks?). Kinda cool though.